On a day of high drama which saw the cricket fraternity reacting with shock to the match-fixing controversy, the ICC launched a probe into West Indian all-rounder Marlon Samuels’ suspicious conversations with an Indian bookie during the India-Windies ODI at Nagpur last month. Mumbai : The name of a man named Robin Singh has figured in the conversations between Samuels and Kochar and the police is trying to figure out whether he is the one who had played for India. Unseasonal showers played spoilsport as the opening one-day match between India and Sri Lanka, the first international tie to be hosted by the city in more than two years, was abandoned at the Eden Garden here today. Nimbus Communications, which has the rights to telecast the India-Sri Lanka cricket series, today became liable to be fined up to Rs 1 crore or slapped a ban for not supplying live feed of the Kolkata match to public broadcaster Prasar Bharati. The International Cricket Council (ICC) today said it would “vigorously” defend the racial discrimination lawsuit slapped against it by Australian umpire Darell Hair. 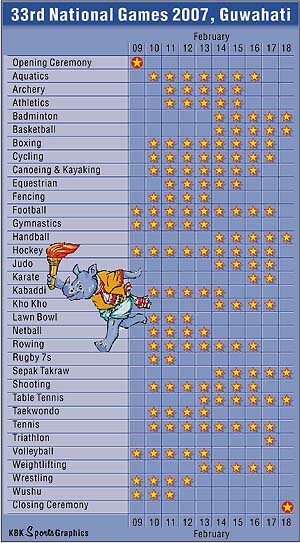 After all the suspense and drama, the attention will shift to the action on the field when the 33rd National Games begin here tomorrow. Amid a spate of walkovers, India’s Anirban Nandi delighted the hosts when he recorded two facile victories on day one of the Pro Tour ITTF 2007 Indian Open $25,000 prize money table tennis tournament at the Indira Gandhi Indoor Stadium here today. Pakistan turned the tables on South Africa when a spectacular batting performance set up a 141-run win in the second one-day international at Kingsmead yesterday. HMV College Jalandhar won the Western Union Six-a-Side Punjab Hockey League beating BD Arya Girls College A 5-1 in the final held at the Olympian Surjit Hockey Stadium today. Government College Ludhiana A finished third edging out Khalsa College Jalandhar A 3-2. A sensational final-ball six robbed India colts of a series-clinching victory against New Zealand Under-19 as the hosts registered a one-wicket win in the second ODI at Lincoln here today. India were held to a 1-1 draw by Myanmar in the first leg of the 2008 Beijing Olympics football qualifiers in Yangon. In a setback for the Jindal group of the Haryana Olympic Association (HOA), a local court today allowed the Abhey Singh Chautala-led group of the association to pay from the HOA account for the expenses of the Haryana contingent for the National Games beginning in Guwahati tomorrow. Meanwhile, BCCI President Sharad Pawar said it was the ICC’s responsibility to take appropriate action. “It’s their responsibility. We have received a report from the Police Commissioner of Nagpur and have sent it to the ICC headquarters in Dubai,” Pawar said. The BCCI made it clear that no Indian player was involved in the latest scandal. “At the moment, no Indian cricketer is involved and we can take action only if anyone is involved,” BCCI Secretary Niranjan Shah said. A day after the sensational disclosure by the Nagpur police that Samuels had contacts with bookie Mukesh Kochar, the ICC confirmed that it had received a report from the police and had directed its Anti-Corruption Unit (ACU) representative in India to carry out an investigation. Samuels was accused of passing information on batting and bowling orders to Kochar. “We have received the report and the ACU representative in India has been directed to carry out the investigation,” a top ICC source told PTI from Dubai. He said, if required, Samuels could be summoned for a cross-examination as part of the probe. In Nagpur, Police Commissioner SPS Yadav said there were enough indications of betting in the Samuels-Kochar conversations but a case could not be registered because of insufficient evidence. Addressing a press conference, Yadav said the police had kept a close watch on Samuels after getting a tip-off that somebody was trying to call him in the hotel room. “On January 19 and 20, that person had called Room No. 206 (where Samuels was staying) of Pride Hotel four times and the calls were made at an unusual time — after 11.30 pm,” he said. “During the conversations, bowling order (of the West Indies team) was discussed. The caller presumed that he knew that the West Indies is going to bowl. And Samuels said he would come as first change bowler,” he said. Yadav said the fact that Samuels stayed back in Mumbai even after the Caribbean team’s departure built suspicion against the player. The ICC said it could only prepare a report on the incident but it was up to the West Indies Cricket Board to take necessary action against the player if he is found to be guilty. If the charges are proved to be correct, Samuels risks being banned for a minimum of two years for violating the ICC Code of Conduct. Deyal, however, indicated that the board would not take things lightly if the claims by Nagpur police turned out to be true. Meanwhile, Samuels’ mother Lunan Samuels expressed shock over the whole episode and said she did not believe that her son had links with a bookie. Mumbai: The name of a man named Robin Singh has figured in the conversations between Samuels and Kochar and the police is trying to figure out whether he is the one who had played for India. “We have to examine if he is former cricketer Robin Singh, who hails from the West Indies but played for India. The Nagpur Police Commissioner is inquiring into the matter. Don’t hype it so much,” Maharashtra DGP PS Pasricha said. Describing Kochar as a well-known bookie suspected to be operating from Gurgaon, the top police official said Kochar was in touch with Kamal Kishore Chadha, who is believed to have done a lot of land deals for underworld don Dawood Ibrahim’s gang. Sri Lanka were 102 for three in 18.2 overs with veteran opener Sanath Jayasuriya, probably on his last tour of India, going great guns on 63 when the skies opened up. The showers, which began at 4 pm, lasted for 45 minutes before relenting. The super-sopper was immediately pressed into service and the mopping up operations began. But the intense efforts of the groundsmen came to a naught as the rains returned soon, dashing all hopes of a restart. The umpires declared the game abandoned at 8.30 pm. The second tie of the four-match series is to be played at Rajkot on February 11, a day before India’s squad for the World Cup is to be selected. City Police Commissioner Prasun Mukherjee succeed Jagmohan Dalmiya as President. 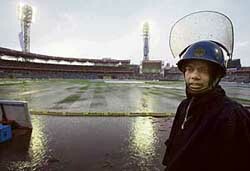 But it turned out to be the first ever limited overs game at the Eden Garden to be washed out. Earlier, Jayasuriya played a typically belligerent knock, plundering 13 boundaries from 61 balls. The Matara Marauder’s innings offset the twin strikes of pacer Munaf Patel, who put the brakes on the initial flourish of the islanders by picking up opener Upul Tharanga (14) and skipper Mahela Jayawardene (0) in successive overs. The visitors were 44 for two in 7.4 overs, but Jayasuriya and Kumar Sangakkara did the recovery act with a 52-run stand for the third wicket before the Sri Lankan vice-captain was devoured by S Sreesanth. Fall of wickets: 1-34, 2-44, 3-96. Action against the company can be taken under an Ordinance that makes it compulsory for private broadcasters to share live feed of important national and international sports events with Prasar Bharati. Nimbus, however, today provided the signals of the India-Sri Lanka match in a transmission delayed by seven minutes, as per an interim court order delivered before the Sports Broadcasting Signals (Mandatory Sharing with Prasar Bharati) Ordinance, 2007 was promulgated last week. “Action against Nimbus can be taken under the Ordinance. But we are seeking legal opinion and would wait to know what the Delhi High court says tomorrow in a case relating to the matter,’’ Joint Secretary Information and Broadcasting Baijendranath told UNI. He said there was a law of the land in force and if any broadcaster violated the law, it can be punished by various means including a ban. Nobody has challenged the ordinance and no court has passed any order in this respect, so its provisions are binding for all, he said, but added that the government would wait for a legal opinion in the light of today’s developments. The court, which heard the matter today, did not come out with any order and posted the hearing for tomorrow. It, however, questioned the rationale of promulgating the ordinance. In an interim order on January 23, the High Court had allowed Prasar Bharati to download the feed of Nimbus Communications and telecast the India-West Indies ODI series in a delayed transmission of seven minutes on Doordarshan(DD) and broadcast commentary live on All India Radio. The ICC’s reaction came a day after Hair confirmed he had instructed his lawyers in London to take legal action against the game’s governing body and the Pakistan Cricket Board for racial discrimination. “The ICC has noted reports that Hair has instructed his lawyers to issue an application to the London Central Employment Tribunal alleging racial discrimination by the ICC and the Pakistan Cricket Board,” ICC said in a statement. “The ICC does not believe there is merit in this claim and will vigorously defend the matter,” it said. Hair, who is currently officiating in an ICC qualifying tournament in Nairobi, was sacked from the Elite panel of umpires after Pakistan complained about his role in a ball-tampering row in the forfeited Oval Test against England last August. The United Liberation Front of Assam, which had earlier given a boycott call against the games and threatened to disrupt them, relented just a few days before the start after an appeal from eminent sportspersons from the state, much to the relief of everyone concerned. The stage is now set for the games to be inaugurated by UPA Chairperson Sonia Gandhi at the opening ceremony at the Sarusajai Sports Complex here. In the first qualifying match, Anirban first tamed Purusottam Bajracharya of Nepal 11-7, 11-6, 11-5, 11-6 and then took the measure of Setio Bowo Utomo of Indonesia 11-4, 11-7, 11-4, 11-9. Due to the non-arrival of the Pakistan and Ghana teams, a majority of the matches ended in walkovers. In other matches, India’s Amal Raj beat Ngai Kwun Li of Hong Kong 4-3, Devesh Karia beat Buddika Walagampala of Sri Lanka 4-1 and Kumar Zubin crushed Ranjit Singh of Nepal 4-0. In what was almost a mirror image of the first match in Centurion, Pakistan hammered 351 for four after winning the toss, only 41 runs fewer than South Africa made on the way to a 164-run win Sunday. South Africa were bowled out for 210. Earlier, Pakistan’s Younis Khan (93) and Mohammad Yousuf (101) batted solidly in a stand of 124 off 136 balls, while Shahid Afridi made a thrilling return to form by thrashing 77 not out off only 35 balls with six sixes and five fours. Yousuf and Afridi put on an unbeaten 129 off 70 balls for the fifth wicket. Opening bowler Mohammad Asif bowled unchanged for his full ten overs at the start of the South African innings, picking up the wickets of Smith and Herschelle Gibbs at a cost of 29 runs. Afridi followed up his batting contribution by taking three for 25 with his leg-breaks, while off-spinner Shoaib Malik took two for 27. Fall of wickets: 1-1, 2-80, 3-204, 4-222. Bowling: Pollock 10-1-53-1, Ntini 9-1-71-0, Nel 10-0-82-0, Langeveldt 9-0-61-1, Kallis 5-0-43-0, Smith 7-0-36-1. Fall of wickets: 1-38, 2-87, 3-110, 4-113, 5-123, 6-147, 7-179, 8-190, 9-208. The matches were played at a very fast pace. In the 15th minute, BD Arya’s Gurjeet converted a penalty corner. But in the 17th minute, Vandana equalised for HMV. In the 25th minute, Amandeep Kaur put HMV ahead. In the 28th minute, Vandana struck again and in the 34th and 39th minutes, Amandeep scored two more goals to settle the issue. In the match for the third place, the scorers for the winners were Manjot and Parjit while Manpreet and Monika scored for Khalsa College. Earlier, in the first semifinal, HMV College beat Khalsa College Jalandhar A 5-0. Baljeet Kaur (Sr) scored three goals, while Vandana and Amandeep scored one goal each. In the second semifinal, BD Arya A beat Government College Ludhiana A 4-2. The scorers for BD Arya were Simranjit Kaur (3) and Kirandeep Kaur. For Ludhiana, Manjot and Rupinder Kaur were the scorers. Before the final match, an exhibition match between Press XI and Coaches XI was played, which ended in 1-1 draw. For Press XI, Kulbir Singh Saini scored from a penalty corner. For Coaches XI, Baljeet Kaur sounded the board. The visitors were bundled out for a paltry 153 in 37 overs after being put into bat. Only Tanmay Srivastava posted a well-compiled 57 with the next best score being 24 by Ravinder Jadeja. India dominated the first half but had to wait till the 54th minute to take the lead through Syed Rahim Nabi yesterday. Mr B.K. Mehta, Additional District Judge, in an interim order, allowed the Abhey group to deduct up to Rs 9 lakh from the bank account of HOA. His group had prayed for the removal of the ban on the operation of the bank account as they claimed to be the official HOA, adding that the Indian Olympic Association (IOA) had recognised them and that their contingent was participating in the games.